Whispers in the Loggia: "Dear Brothers and Sisters, We Are the City!" 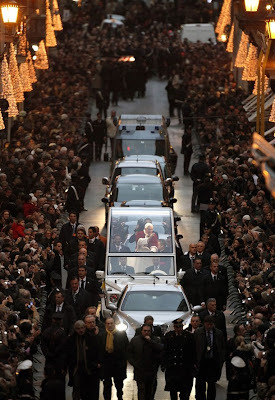 Yet again on this feast of the Immacolata, B16 made the Pope's traditional Santa-esque appearance at Rome's Piazza di Spagna, packed as ever with the natives joining in to pay "homage" to its Marian statue and, ergo, open the Urb's Christmas season. And in this beat's Coup of the Week, AsiaNews trumped the Holy See and all its organs in quickly producing not just a fulltext, but an English one, of the pontiff's address to the city. In the heart of Christian cities, Mary constitutes a sweet and reassuring presence. In her self-effacing style, she gives everyone peace and hope during the happy and sad moments of life. In churches, chapels or the walls of buildings, a painting, mosaic or a statue stand as a remainder of the Mother’s presence, constantly watching over her children. 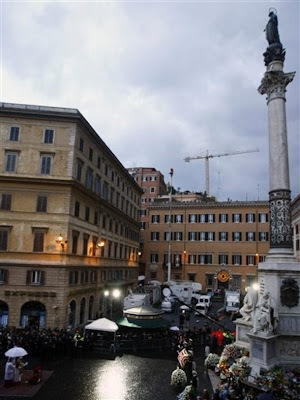 Here too in Piazza di Spagna, Mary stands high, on guard over Rome. What does Mary tell the city? What does her presence remind us? It reminds us that “where sin increased, grace overflowed all the more (Rom., 5:20), as the Apostle Paul wrote. She is the Immaculate Mother who tells people of our time: Do not be afraid, Jesus defeated evil, uprooted it, freeing us from its rule. When do we need such good deeds? Every day, in the newspapers, television and radio, evil is told to us, said again, amplified, so that we get used to the most horrible things, and become desensitised. In a certain way, it poisons us, because the negative is never fully cleansed out of our system but accumulates day after day. The heart hardens and thoughts become gloomy. For this reason, the city needs Mary, whose presence speaks of God, reminds us of Grace’s victory over sin and makes us hope even in the most humanly difficult situations. Those who [are] invisible live or rather survive in the city. They make it to the front page of newspapers or the top of TV newscasts—they are exploited until the end, for as long as the news and the images are newsworthy. Few can resist such a perverse mechanism. The city first hides, then exposes them to public scrutiny, without pity or with false pity. Everyone would like to be accepted as a person and considered as something sacred, because each human story is a sacred story that deserves the utmost of respect. Dear brothers and sisters, we are the city! Each one of us contributes with our lives to its moral climate for better or worse. The border between good and evil runs across everyone’s heart and none of us should feel entitled to judge others. Instead, each one of us must feel duty-bound to improve ourselves. Mass media make us feel like “spectators” as if evil only touched others and that certain things could not happen to us. Instead, we are all “actors” for better or worse, and our behaviour influences others. We often complain about air pollution, that in some parts of the city the air is unbreathable. That is true. Everyone must do his or her part to make the city a cleaner place. However, there is another kind of pollution, which the senses cannot easily perceive, but which is equally dangerous. It is the pollution of the spirit, which makes us smile less, makes us gloomier, less likely to greet one another or look into each other's face . . . The city has many faces, but sadly, collective factors lead us to forget what is behind them. All we see is the surface. People become bodies, and these bodies lose their soul, become faceless objects that can be exchanged and consumed. Dear Roman friends and all of you who live in this city! Whilst we are busy in everyday tasks, let us listen to Mary’s voice. Let us hear her silent but pressing appeal. She tells each one of us that wherever sin increases, may grace overflow all the more, first in our hearts, and then in our lives! Thus, the city shall be more beautiful, more Christian and more humane. Thank you, Holy Mother, for this message of hope. Thank you for your silent but eloquent presence in the heart of our city. Immaculate Virgin, Salus Populi Romani, pray for us!